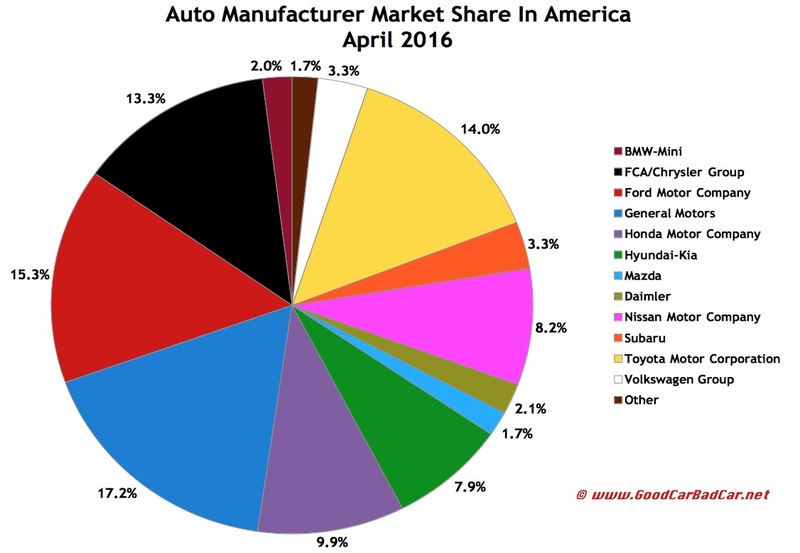 Forecasters expected April 2016 U.S. auto sales to grow by approximately 4%, year-over-year, a gain of about 58,000 sales. In reality, auto sales grew 3.5% to 1.5 million units, a healthy month with approximately 51,000 more sales than the industry managed a year ago, but not a return to the sales pace of late 2015. Fiat Chrysler Automobiles’ early report revealed a 6% uptick in April, an increase of 10,604 units for FCA’s six core brands. For the Jeep brand and the Ram pickup line, this was the best April ever. The Ford Motor Company’s 4% increase occurred as Lincoln added 1642 sales, as Ford’s utilities jumped 4%, and as Ford F-Series pickup trucks rose 13%. As GM fleet volume tumbled (somewhat intentionally) by around 18,000 vehicles, GM’s overall sales fell 3.5% thanks to declines at each and every GM brand, including a 29% drop at Cadillac. Nissan’s 13% year-over-year improvement easily outpaced the industry’s growth. An Infiniti gain was of assistance, but Nissan USA’s real increase in strength was powered by a 16% car uptick in a struggling car market and big gains from the Frontier, Murano, and the brand’s vans. 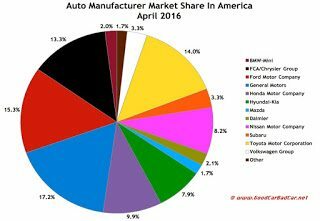 After trailing Nissan USA by more than 42,000 sales through the first-quarter of 2016, American Honda crushed its compatriot by some 25,000 units in April alone thanks to a strong month from Acura and big Accord, Civic, and Odyssey gains. Toyota, meanwhile, stumbled through the first-quarter but produced a company-wide 4% U.S. sales increase in April. Lexus’ decline continued, however. High incentive spending fuelled much of the increase. Pickup trucks deserve much of the credit, too, as sales of 11 truck nameplates grew nearly three times faster than the industry overall. Six premium brands, including the three most popular, posted year-over-year sales declines. There are more details on smaller manufacturers’ April performance below the results table. If you don’t wish to see automakers arranged alphabetically, click column headers to sort automakers by April sales, year-over-year change, year-to-date totals, or any other order. Best seller lists for cars, trucks, and SUVs will be added later this afternoon. In the coming days, GCBC will also publish a complete list of year-to-date sales for every single vehicle line, a list which includes brand results. (Check out the 2015 version here.) You can always find historical monthly and yearly sales figures for any brand by clicking the brand name in the table below or by selecting a make (or model) at GCBC’s Sales Stats page. Click column headers to sort by specific categories. Using the mobile version of GoodCarBadCar? Switch to the web version at the bottom of the page, at which point columns will be sortable. ^ Excluding Sprinter/Metris: up 0.2% to 29,236 in April; down 2.2% to 105,005 YTD. Automotive News estimates 2250 April sales for Tesla. Audi’s 6% April gain occurred despite a 10% loss from its best-selling car, the A3, and thanks to the strength of its Q lineup of crossovers, including its best-selling Q5 crossover. The Q3, Q5, and Q7 produced 1651 additional sales this April than last. After a dreadful first-quarter, Mazda begins Q2 with rebounding April sales. More Mazdas were sold in April 2016 than in any April since 1995 thanks to gains from the 3, MX-5 Miata, and additional CX-3 sales that didn’t exist last year at this time. Volkswagen’s 10% drop occurred as Golf, Jetta, Beetle, Eos, Passat, CC, and Touareg sales all fell. Subaru reported record April sales of more than 50,000 units, with the biggest increase coming from the Outback, which jumped 14%. Mercedes-Benz’s premium division managed a slight 0.2% increase in April thanks to big gains from the company’s SUVs, 14,286 of which were sold last month. BMW finished April 9441 sales behind Mercedes-Benz on year-to-date terms. Lexus is 5902 sales behind the premium leader. Mitsubishi added 1458 April sales with big gains from the Mirage and Outlander. Kia’s 6% expansion was powered by improved Forte, Sportage, and Sorento sales. Kia’s Hyundai partner tumbled 9% in April, a loss of nearly 6000 sales, as the Sonata and Elantra both plunged.